Huawei has been bragging about the P30 Pro and its camera capabilities since even before unveiling the phone. The Chinese company has truly been pushing the boundaries of what smartphones can do. The latest Huawei P30 Pro flagship will be competing against the best of Samsung, Apple, and Google. We have already taken a look at how the P30 Pro stacks up against Samsung’s Galaxy S10 Plus and Apple’s iPhone XS Max. 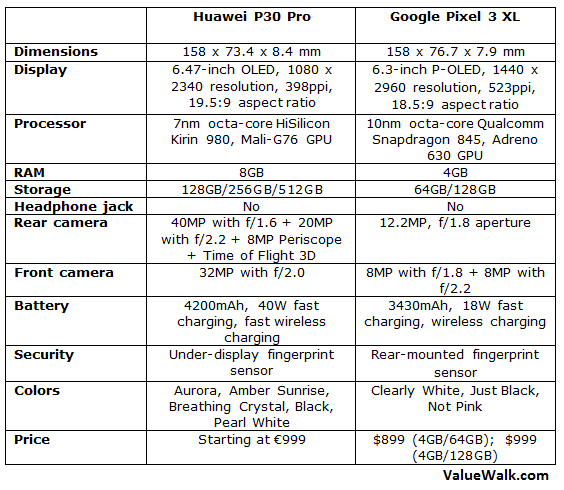 Now let’s check out a detailed Huawei P30 Pro vs Pixel 3 XL comparison to see whether Google’s phone is capable of competing with the latest and greatest from Huawei. The Google Pixel 3 XL has been around for quite a while, so it carries last year’s technologies. But it reflects the best of Google’s hardware prowess. The P30 Pro, in contrast, is jam-packed with cutting edge technologies to not only compete with the existing flagship phones from rivals but also stay relevant when competitors bring new devices later this year. The P30 Pro features a curved display with a tiny drop-notch to accommodate the camera. The smaller notch means there is no 3D facial recognition. It has an incredibly thin chin at the bottom. It measures 158 x 73.4 x 8.4 mm and weighs 192g. Huawei has used a metal and glass body with nine layers of what it calls Nano Optical Layer. It comes in five different color options: Aurora, Amber Sunrise, Breathing Crystal, Black, and Pearl White. The phone features an in-display fingerprint sensor and in-display ear speaker. However, the under-display fingerprint sensor is an optical one that takes a 2D image of your finger. It is said to be slower and less secure than the ultrasonic fingerprint sensor used in devices like Galaxy S10 Plus. The P30 Pro comes with an IP68 rating for water- and dust-resistance, which means it can stay in up to 2 meters deep water for 30 minutes. Hardware is not the biggest strength of Google, and it’s clearly reflected in the Pixel 3 XL design. The device features a thick chin at the bottom and a notch at the top that makes it look like a low-range phone. It measures 158×76.7×7.9 mm and weighs 184g. Its rear panel is made out of two-tone glass. The Pixel 3 XL has a rear-mounted capacitive fingerprint sensor for authentication and security. The Pixel 3 XL also comes with an IP68 rating for water- and dust-resistance. It is available in Clearly White, Just Black, and Not Pink colors. Both phones lack the traditional 3.5mm headphone jack. Both the phones use OLED panels, which means they both offer vibrant colors and truer blacks. The P30 Pro gets a slightly larger 6.47-inch OLED screen with a Full HD+ resolution of 1080 x 2340 pixels. Compared to Pixel 3 XL, it has a lower resolution covering a bigger screen. It has a pixel density of 398ppi, an aspect ratio of 19.5:9, and 88.6% screen-to-body ratio. In contrast, the Pixel 3 XL sports a 6.3-inch flexible P-OLED display with Quad HD 2,960×1,440 resolution and 522ppi pixel density. It has an 18.5:9 aspect ratio and 82.8% screen-to-body ratio. The Always-on display is protected by Corning’s Gorilla Glass 5. The Huawei P30 Pro is a beast when it comes to performance. The phone runs Huawei’s in-house HiSilicon Kirin 980 processor built using 7nm process technology and Mali-G76 graphics processor. It also features two dedicated Neural Processing Engines (NPUs) to speed up the AI-related tasks. Benchmark results have shown that it’s more powerful than the octa-core Snapdragon 845 SoC found inside Google Pixel 3 XL. The P30 Pro packs 8GB of RAM and three different storage options of 128GB, 256GB, and 512GB. It also has a nano memory slot that supports up to 256GB of external storage. The Google Pixel 3 XL runs Snapdragon 845 processor with just 4GB of RAM. It comes in 64GB and 128GB of internal storage options. Google doesn’t support external storage on its phones, but it does allow unlimited free cloud storage of photos and videos in their original quality. The P30 Pro packs a giant 4200mAh battery with ultra-fast charging. With Huawei’s proprietary 40W charger, it delivers up to 70% charge in just 30 minutes. It also supports fast wireless charging and reverse wireless charging. The Pixel 3 XL includes a 3430mAh battery with 18W fast charging and Qi wireless charging support. The Chinese company uses its own EMUI 9.1 skin on top of Android 9 Pie, which means the P30 Pro has a custom user interface. The Pixel 3 XL runs the stock version of Android Pie and it doesn’t have any bloatware. The Pixel devices are among the first Android phones to receive software and security updates from Google. This is where the P30 Pro truly shines. It gets a quad-camera setup on the back that lives up to the hype. According to DxOMark, the P30 Pro is the best smartphone camera in the world. It features a 40MP primary sensor with f/1.6 aperture and OIS support, a 20-megapixel wide-angle lens with f/2.2 aperture, and an 8MP ‘Periscope’ zoom lens that offers 5x optical zoom and 10x hybrid zoom. The fourth camera is a Time of Flight 3D depth sensor that creates a 3D image of the scene based on the time taken by light to bounce off various objects in the scene. The P30 Pro can shoot videos using two cameras simultaneously. On the front, it gets an impressive 32MP selfie camera with f/2.0 aperture. The Pixel 3 XL camera also offers an excellent photography experience, but it can’t match the capabilities of Huawei P30 Pro. The Pixel 3 XL packs only a single 12.2-megapixel lens with f/1.8 aperture and OIS support on the back. Google uses AI algorithms to take portrait images with blurred backgrounds. The Night Sight mode and HDR support on the Pixel 3 XL are also brilliant. The device gets two 8-megapixel cameras on the front for selfies. Both handsets cater to the premium segment. 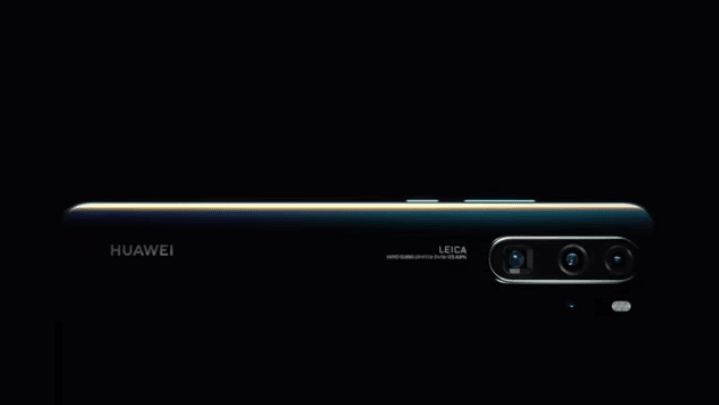 Unfortunately, the Huawei P30 Pro won’t launch in the US due to the political controversy and security threats involving the Chinese electronics giant. In European markets, the P30 Pro has a starting price of €999 for the base model with 128GB storage. The Pixel 3 XL costs $899 for the 64GB variant and $999 for the 128GB model.